Feedback from clients working with practicing students. What do you what makes you tick? Come and Experience great Self-Improvement (in English, French or German) - you will be giving to both yourself and to help local charities. 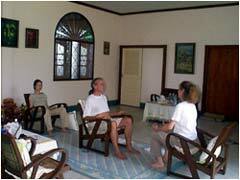 The Pothiyalai Spiritual Center is conducting Self-Improvement Training by request. During this training, we are glad to offer you Self- Improvement Sessions from our graduate students for only 1,000 baht per Session (regularly priced at 2000 baht). We offer two available times each day by request. All the income from this special offer is donated to local charities. If you know someone who might need to improve their vitality of well being and balance their energy, please let them know as well. Once you begin to answer these questions, you will start inquiring into their meaning. Develop your intuition. 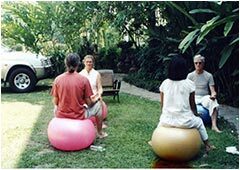 Transform thought forms and change the neurological pathways of the brain by means of "Self-Processing" As a result, spontaneous and harmonious Kundalini energy is utilized for healing and creativity. By means of clairvoyant insight and exercises one finds out what one really wants to do and how to create a new self. Breathing exercises to release negative energy from the inner organs. 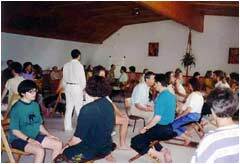 Physical exercises to open up and recharge energy centers. Color breathing meditations to let out deep negative emotions. Exploring your inner blocks and dissolving negative energy through different postures. Find your character structure, vibrations, direction and transformations within different levels. Practice the psychic ability of visualization to establish internal vision. Meditations to enhance the experience of each self processing. Develop the skill of your inner voice and intuitions. Create the process of inner self-healing to gain a higher energy-potential in order to obtain your objectives. 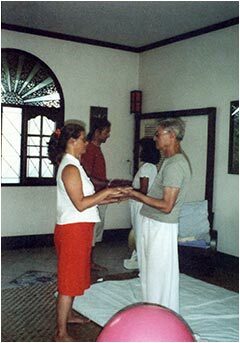 Tune your energy center to be centered and gain more positive energy with deeper understanding of your situation. If you want to create a new life with new ability and the possibility to be a great healer and also exploring your clairvoyant ability as a clairvoyant and spiritual counselor.